Intended Student Audience: Undergraduate students with three or four years of Spanish language instruction. The course is taught in Spanish but serves majors and non-majors. This course gives students the opportunity to approach Spanish dramatic literature through a creative and experiential learning process. The theme of the fall 2017 workshop was: Enacting Oppression. All the plays studied deal with this topic from very different perspectives and historical eras (from Lorca’s rural tragedy The House of Bernarda Alba to Juan Mayorga denunciation of the Holocaust in Himmelweg). The first half of the course is devoted to studying the plays from a literary, critical and analytical lens and the second half is dedicated to exploring theater through various aspects of staging, such as dramaturgy, acting, translation, setting, costume and sound design. Students work in groups to organize a series of original scenes from the original plays studied in the first half of the semester and these scenes are then adapted, directed and performed as the final outcome of this seminar. Professor Fernández designed her course on Spanish Peninsular literature with the creative arts and experiential learning as central teaching strategies. In addition to introducing the students to a wide array of Spanish plays from the Early Modern period to the present, students in her course have the opportunity to create an original script as the final outcome of the seminar. The course's experiential component encourages students to approach literary analysis from the perspective of those who write, design, and conceptualize literature and theater. The course followed the structure of a symposium developed by scholars (including Professor Fernández ) in the research network Iberian Theater and Performance Network (ITPN). At the center of the most recent biannual symposium was an effort to design a performance specifically tailored to the theme of the conference. The organizing committee created an original script based on a series of scenes from the major dramatic works with the guidance of two professional actors and a dramaturge. Adapting the ITPN model, Professor Fernández has students work together over the course of the semester to adapt, direct and perform their own play as the final course product. Students write their own play by pulling together a series of original scenes from the plays studied in the first part of the course. Creating their own play in this manner encourages students to analyze and understand the the nuances of oppression - the course theme - in each play, looking for similarities, differences, and variants. Students are encouraged to engage in a deeper and richer analysis of each play. Professor Fernández wants students to have the freedom to be creative in the development of their final play for the course. This requires careful scaffolding of assignments that allow for curiosity and discovery to emerge organically. Professor Fernández organizes student work around several assignments, but leaves plenty of unstructured class time for students to work in groups to develop the play and discuss their contribution to the final product. After the class develops and organizes the scenes for the final play students work in small groups to contribute one element to the performance of the play, such as costume design, the play bill, or staging. At this point in the course Professor Fernández says students are intensely engaged from the very beginning of the process until the end. In a sense they are "creating the class." The experiential and collaborative design of the course is a new experience for many humanities students. Early in the semester Professor Fernández prepares students for their central role in the course design and outcome by reminding them that this is not a “traditional” literature class. However, literary analysis and critical thinking are emergent learning outcomes as self-directed learning takes shapes over the semester. In future iterations of the course Professor Fernández would like to have students perform the play at the end of the semester. Many students enrolled in the course are double majors and she was concerned with the first run through of the course it would be asking to much of them to learn lines and perform publicly. Therefore, she decided that the best thing would be to film a version of a dramatic reading of the play. However, as the end of the semester drew near she found that a public performance would have been a perfect showcase for the the students' commitment, excitement, and hard work. According to Fernández: "This course is so experiential that I believe the students deserve a creative outcome." For future iterations of the course she is hoping to organize a dramatic reading that could be performed publicly for the Rice Community. A' Q & A' session about the play, the class, the project as a whole would take place after the performance. A course with this level of group work and self-directed learning requires an appropriate classroom space. Many of the course meetings ended up taking place in outside spaces on campus to allow students to experiment and get creative. A black box theater will also be ideal for some of the sessions. In addition, Professor Fernández plans to explore the resources that the Rice Theater Department could offer in terms of basic props, costumes, space, and guidance of some components of the performance. This network was developed to enhance the study of Iberian theater and performance from a trans-historical perspective, bridging Golden Age theater (1580-1700) with contemporary performance, playwriting, and theatrical practices in the plurinational setting of the Iberian Peninsula. Esther Fernández Rodríguez is the author of Eros en escena: Erotismo en el teatro del Siglo de Oro (Juan de la Cuesta, 2009) and the editor of Don Gil de las calzas verdes (2013) and El perro del hortelano (2011) for Cervantes & Co. Spanish Classics. Additionally, she has co-edited Diálogos en las tablas: Últimas tendencias de la puesta en escena del teatro clásico español (Reichenberger, 2014). Her essays and occasional publications attend to eroticism and the Spanish comedia; visual and material culture; and performance analysis of classical theater’s contemporary adaptations. In her teaching and scholarship she combines Early Modern literature with visual performance analysis. She also teaches classes in contemporary literature with a focus on contemporary social and political issues. Dr. Fernández’s current work includes editing a volume that explores Anglo-Spanish relations vis-a-vis the contentious image of Elizabeth I in Early Modern Spain, as well as a monograph on the ritualized figure of ‘the puppet,’ in ceremonial and theatrical contexts, which served to materialize representations of religious and ‘non-religious’ worlds across pre-modern Iberia. Posted on May 15, 2018 by Robin Paige and filed under Humanities and tagged Experiential Learning Project-based Learning. STUDIO SHORT: THE "GAME OF SOCIAL LIFE"
Course Description: The purpose of this course is to provide students with a broad introduction to the major themes that characterize today's social psychology. The course covers the following major topics: how we view ourselves and others; the cultural sources of our attitudes and the subtle forces that affect us; how attitudes and behavioral elements shape our relationships; and, how social psychology applies to practical contexts. How to encourage students to engage in difficult dialogues and to see the connection between course material and their own lives? It is often difficult to get students engaged in critical, reflective, and meaningful discussions in large survey courses such as PSYC 202: Introduction to Social Psychology. Parsons’ course generally enrolls between sixty and eighty students each semester and while a large number of these students are psychology majors/minors or those interested in the discipline, many are students looking to fulfill their distribution credit in the social sciences. In addition the course must cover a large amount of content to provide an overview of the well-developed field of social psychology, limiting the available class time for in-depth discussions. Without the opportunity for reflection, dialogue, and application Parsons has found that students have a difficult time connecting the material of the course to their own lives. Yet she has found that when students can see connections between the course material and its relevance to their own lives, deeper learning occurs and students are able to actively engage in the learning process. Parsons has successfully adapted a role-playing learning activity called "The Game of Social Life," developed to by the social psychologist Kosha D. Bramesfeld at Ryerson University, to her lesson on privilege and structural inequality. In this activity Parsons assigns students a 'profile' that details characteristics such as race, sexuality, disability, health, experience/education, etc. Students are then presented with strategy game whereby they will have to make decisions with the goal of maximizing their character's potential. Students are faced with decisions, such as which neighborhoods to live in, which schools to attend, voting decisions (if they are able to vote), and how to spend their free time. The decisions students are asked to make and the constraints they are under due to their 'profile' characteristics encourage them to examine inequality across multiple domains, including access to social power, health care, housing, education, and occupational success throughout the lifespan. The simulation also asks students to examine the impact of inequality on health and well-being. During and after the activity students are asked to discuss with each other how they made decisions, illustrating the differential constraints that students are under due to their different 'profiles.' This encourages students to examine how some individuals have more access to resources, power, and advantages than others due to characteristics they have little control over such as gender, race, wealth, and disability. The activity provides students with the opportunity to apply the concepts of privilege, oppression, and inequity in decision-making scenarios and to reflectively situate themselves in these unequal structures. Parsons says that the game allows participants to experience aspects of privilege and oppression in the context of a role-playing game as well as to externalize their experiences of privilege and oppression in a safe environment, prior to internalizing these issues and examining them in their own lives. The in-class execution of the game takes a lot of preparation and organization on the part of the instructor. She advises that it is best to introduce a role-playing game at this level of sophistication after the first few weeks of class or later when students have had the opportunity to get to know the instructor and their peers better. Sandra Parsons is an Assistant Teaching Professor in the Department of Psychology at Rice University. She teaches Introduction to Social Psychology (PSYC 202), Research Methods (PSYC 340), and Motivation and Emotion (PSYC 353). She earned her B.A. in Psychology from the University of Virginia and her M.A. and Ph.D. in Social Psychology from Miami University. She is a department advisor and faculty advisor for Psi Chi, an honor society for psychology majors. Dr. Parsons is also a Faculty Associate at Will Rice College. Her research interests include social identities, gender, and decision-making in groups. Posted on April 24, 2017 by Robin Paige and filed under Social Sciences and tagged Experiential Learning Role-play Large Lecture Peer Learning. An overview of computer engineering, focusing on the five classic components of every computer: memory, input, output, control, and datapath. Students explore the interaction and use of these components in the modern digital computing system including logic design and assembly language. These key components are studied using a state of the art integrated development environment to analyze the internal workings of a high-performance microcomputer. Use computers more effectively by understanding how they work. Be able to engineer a new computing system. Understand the role of computer engineering in your future. Most students enroll in ELEC 220 in their freshman or sophomore year. Students enter the course with diversity of backgrounds and experience working with computers. Some students participated in "hack-a-thons" prior to entering college, while others are working with computers for the first time. There are no prerequisites for the course, but the course is itself a prerequisite for a variety of concentrations in the Electrical and Computer Engineering major as well as the Computer Science major. To develop the skills and knowledge necessary for computer engineering, the course covers a large number of topics and skills. However, a primary focus of the course is hands-on practice and experience with both hardware and software. An overview of how we used the TILaunchpad for hands-on-labs in ELEC 220: Fundamentals of Computer Engineering. Simar designed the course around an experiential approach with labs that are organized to allow students ample time to work at their own pace with the help of 'peer-instructors' to facilitate knowledge discovery and skill development. Each student uses their own laptop and purchases a mobile hands-on platform (around $15) for the lab sessions. These platforms include: (1) a TM4C123 Launchpad; (2) Sidekick for the launchpad; and, (3) installation of Code Composer Studio integrated development environment on the laptop. The use of these personal, mobile platforms allows students to work with the hardware and software both in the lab and on their own outside of the class. Theory is demonstrated in lecture using the same mobile platform allowing students to test and apply the theories on their own devices. The mobile platform also enables the use of Rice University's experimental classroom in Herring 129 where an open lab space allows the students plenty of space to work individually or in groups. The undergraduate peer-instructors, or lab assistants, are able to easily move throughout the space to help students and offer guidance. With 200 students enrolled in the course, Simar finds that the lab assistants are an integral part of the experiential course structure. The lab assistant to student ratio is 1 to 5, enabling both a high frequency and duration of student to lab assistant interaction. All lab assistants were students in one of the prior semesters of the course giving them a peer-level perspective on the course pedagogy and content. At the end of each lab Simar brainstorms with the lab assistants and debriefs on student progress during the lab and areas that may need to be addressed in the following lecture and lab. These planning sessions create a course that is responsive to student learning, allowing Simar to build an environment that enables self-paced learning during the labs. The success of the lab experience is a team effort, led by Electrical and Computer Engineering graduate student Chance Tarver, Simar, and a team of fifteen undergraduate lab assistants. The ELEC 220 labs are designed to address the challenge of students entering the course with diverse backgrounds and a wide variety of computer-based skills and knowledge. Each week the students meet in one of five scheduled labs in the evening for three hours. Building off the flexibility of the mobile platform, the classroom, and the use of lab assistants, Simar structures the labs so that students can stay for as long as they need to master the material outlined for that particular lab. In addition, students can repeat the labs as many times as they like by returning to a later lab session during the week or completing the lab exercise on their own time. The flexibility of the labs creates a low-stakes learning environment in which students can attempt problems, monitor their own success, get immediate feedback and guidance from the lab assistants, Tarver, or Simar and try again or move on to the next set of problems. This flexibility allows for self-paced learning, encouraging students to develop a metacognitive understanding of their own mastery of the material. Chance Tarver meeting with lab assistants during a lab session. Simar was successfully able to design the ELEC 220 course to address many of the challenges the entry-level course encounters. However, he found that there are several on-going challenges for the course. To begin with, because the course is a prerequisite for courses in other majors and for the many concentrations in the computer science major - computer engineering, photonics, data science, among others - the course needs to cover a wide variety of topics that do not always seamlessly fit together. This can be confusing for students as they find the knowledge and skills they are learning are often compartmentalized. To address this issue in future semesters Simar has organized the course into modules that address specific areas of computer engineering helping students to organize what they are learning. By exposing students to a wide variety of topics and areas of the field he hopes to help students clarify their future goals in computer engineering. Simar has been meticulously collecting feedback each semester from students, lab assistants as well as faculty teaching courses for which ELEC 220 is a prerequisite. The feedback from students and lab assistants has emphasized more opportunities for the structured practice and application that the labs allow for. Therefore, future iterations of the course are planned to allow more lab time for students to do self-paced work with the help of feedback from the lab assistants and professor Simar. The course has also seen an increase in demand with higher enrollment over the last few semesters. Given the course's foundational role in preparing students for more advanced course work, as well as the success of Simar's course redesign, the department is investigating offering the course once each semester instead of just once a year. Simar is also working closely with other faculty teaching higher level computer engineering courses to insure the course content, skills, and topics covered are preparing students for more rigorous study in computer engineering. This paper presents the mastery approach in a computer engineering class and discusses the promise of the approach for developing skills in foundational classes. In this 2008 paper the authors present results from a study of the mastery approach on both learning and assessment in computer engineering. The authors of this study found that homework designed around the concept of mastery learning and formative feedback enhanced student learning and their time on task. This Faculty Focus post provides a brief discussion of the balance between mastery and performance goals in course design. Results from this study of peer instruction in a computer science classroom show that students found the class enhanced their learning due to the "interactive" rather than "active" aspects of the course. Brown University's Center for Teaching provides an overview of best practices for working with undergraduate teaching assistants. This 2015 paper measures the impact of instructional labs on mastery learning in the science classroom and offers suggestions for course design. Ray completed his B.S. in Bioengineering at Texas A&M University and his M.S. in Electrical and Computer Engineering at Rice University. He teaches courses in digital signal processing and computer architecture. Prior to returning to Rice University, he spent 25 years as an engineer at Texas Instruments, working on semiconductors and leading teams developing computer architectures for digital signal processing. In 2013, Ray was named as a Distinguished Engineer of the Association for Computing Machinery. In 2011, Ray was named a Fellow of Institute of Electrical and Electronics Engineers. And, in 1997 he was named a Texas Instruments Fellow. Ray has more than 25 patents covering everything from computer architecture to neural networks and high-tech aids for golf. Carrie Toffoletto, Executive Administrator for the Department of Computer and Electrical Engineering, for her guidance and support on our use of the space. Her knowledge of Montessori techniques has shaped how we use the space. Chance Tarver, graduate student Electrical and Computer Engineering, for his leadership in creating the labs and leading the lab assistants. Jennifer K. Hunter, Visibility Specialist in Electrical & Computer Engineering at Rice University, for use of the photographs. Posted on February 27, 2017 by Robin Paige and filed under Engineering and tagged Mastery Learning Peer Learning Metcognition Undergraduate TAs. In this class we will treat social theory as a lens for understanding the modern social world and constructing explanations for changes in society. There are three main course goals. First, we will consider the role of theory in sociological research. Second, we will examine how the theorists’ ideas were shaped by the social and historical context in which they were produced. Third, we will weave together and apply the work of social theorists to the modern world in which we live in. We will accomplish these goals by reading original texts and empirical readings to examine how sociologists draw on theory to explain the modern world. How to encourage deeper conceptual understanding of sociological theories? SOCI 380 is a requirement for sociology majors and minors. It is among the most challenging courses to teach because many sociology students postpone taking social theory until their last year of study, focusing instead on empirically based sociology courses. Therefore, Chávez's class seeks to train students who are well versed in the empirical and methodological foundations of sociology in more abstract 'sociological thinking.' Chávez faces the challenge of guiding them through, what is often, their first exposure to reading and analyzing primary sociological texts and encouraging them to engage deeply with challenging sociological theories and concepts. One of main pedagogical approaches Chávez unitizes to develop students' sociological thinking is to make the material relevant to their everyday lives. Since many of the class texts and readings were written fifty to a hundred years ago, Chávez looks for contemporary examples with which student's can deepen their understanding of the concepts and theories. Chávez says that one of the best resources for contemporary examples are the students themselves. Therefore, he focuses on activities that encourage peer-to-peer instruction and are fun and engaging at the same time. One of his favorite in-class activities is "speed-dating for exam review." Chávez utilizes this activity before the midterm exam to provide students with a quick in-class review of the concepts and theories they will be responsible for knowing. The activity provides students with the opportunity to refine their understanding, articulation, and application of concepts. The conceptual foundation for the activity is itself a review of a concept students recently studied - rationalization. Chávez begins the activity by discussing how 'speed-dating' is an example of the rationalization of intimate relationships between people. For the rest of the class session students rotate into new pairs every two minutes over a series of short "review dates." During each "review date" students are asked to discuss and find examples for a concept that is given to them on a prompt. At the end of two minutes they move on to a new "review date" with a different student and repeat the process. Chávez says that one of the benefits of this activity is that it creates a fun and relaxed learning environment for students who are often nervous about their understanding of the course material heading into the first midterm exam. When the "speed dating" begins the classrooms erupts in discussion, excitement, and some nervous laughter. Chávez found that students are rarely hesitant to dive quickly into conversation about the concepts and theories. However, since there are anywhere from 10-20 pairs of students during each "review date" it is difficult for Chávez to keep track of all student discussions and monitor them for any misconceptions that might need to be addressed. To address this he circulates quickly between pairs of students during "review date" sessions for particularly difficult concepts looking for common misunderstandings that he can address at the end of the class session. Sergio Chávez is an assistant professor of sociology at Rice University. He received his B.A. in sociology from the University of California Davis and his Ph.D. from Cornell University. Dr. Chávez has conducted field research in Tijuana and Guanajuato, Mexico and North Carolina on internal and international migration, labor markets, social networks, and the border. His book BORDER LIVES (2016) examines the dynamic migration and working strategies border migrants employ on a daily basis as immigration policies, border enforcement, economic restructuring, and social resources evolve in the cross-border urban environment of Tijuana. Dr. Chávez teaches courses on social theory at the graduate and undergraduate level, qualititative methods, and work and occupations. Posted on February 21, 2017 by Robin Paige and filed under Social Sciences and tagged Active Learning Peer Learning. Course Description: Develop critical insight into basic biological mechanisms of biochemistry, cell biology, genetics, and development of animals and plants through exploration of initial observations, definition of problems and questions, construction and testing of hypotheses, and analysis of the results of experiments. How can we create opportunities for learning through small group discussion and peer instruction in a large lecture class? Gustin's BIOC 201 is a popular introductory course enrolling around 200 students each semester it is offered. The course is a requirement for BioSciences majors, a prerequisite for upper level courses in the BioSciences and other disciplines, and it also fulfills the University's distribution credit for science courses. Therefore, students enter the course with varying levels of preparation in the biological sciences and different motivations for mastering the material. Gustin says that in order to facilitate more meaningful learning experiences he knew he had to get students talking to each other and working together during class. However due to the survey nature of the course, the lectures cover a large amount of material and are fast paced leaving little time for students to work together in groups during lecture. In addition, the large course enrollment creates logistical challenges for managing group work and discussion during lectures. To create structured opportunities for small group work Gustin decided to make it an integrated part of the course design. At the beginning of the semester each student is assigned to a team of 10-12 students that they will work with over the semester in breakout discussion sections. Eight class meetings over the semester (about 15% of classes) are dedicated to these breakout discussion sessions. Prior to each breakout session, Gustin assigns a few questions or provides a topic that one or two team members on each team must address. For example, for one session students are asked to create an analogy for one of the topics discussed in the previous lectures. These students prepare a response ahead of the discussion section, then give a presentation to their teammates and guide discussion during the breakout session. An undergraduate teaching assistant is there (with a rubric) to observe and make sure all students are participating. At the end of the discussion session another student on the team writes up a summary of the discussion and identifies any unanswered questions. Before the next lecture Gustin scans these write-ups for the ‘unanswered questions' and these become potential topics for extra credit on the next exam. He says that this motivates all students in the class to read and try to answer these 'unanswered questions,' which are posted on the course webpage. In addition, when appropriate, he brings the work completed in these small groups back into the large group lecture. For example, the lecture following the analogy assignment he presents all of the analogies to the whole class and they vote on what they believe are the best two analogies. In this way, Gustin encourages students to see the small group work and peer instruction as an integrated part of their overall learning in the class, as opposed to 'supplemental' or 'additional' coursework. Gustin says that there have been a few challenges with implementing these small group breakout sessions that he has not yet found solutions for. To begin with, due to the large number of students enrolled in this course integrating small group work at this level requires a lot of administration on the part of the instructor. Using undergraduate teaching assistants helps with some of the administrative tasks, but Gustin says he continues to look for ways to streamline the administration of the group discussion sessions. Gustin has also found that student absences from the small group discussion sections are difficult to account for since the these class meetings are more heavily factored into students grades than lecture meetings. This is particularly challenging when it comes to student athletes who may miss classes when their sport is in season. Mike Gustin is a Professor of Biochemistry and Cell Biology. He has earned multiple teaching awards over his 25 years at Rice University. In 2016 he received the George R. Brown Certificate of Highest Merit, thereby officially being retired from the competition for the Rice University Brown Teaching Awards. Professor Gustin's research is in the area of molecular genetics and biochemistry of signal transduction. Posted on August 8, 2016 by Robin Paige and filed under Natural Sciences and tagged Discussion Peer Learning Large Lecture. Course Description: This course serves as an introduction to electricity and magnetism. Students will learn about how matter becomes charged, and about the physical interactions between charges as described by Maxwell’s Equations. Applications to basic circuit elements in both DC and AC circuits will also be addressed. How can we create a class climate in which students feel comfortable to ask questions? Hafner's PHYS 102 lecture course enrolls between 100-200 students each semester. The format of the class is fast-paced as students are introduced to the basic concepts of electricity and magnetism through lecture and demonstrations. This introductory physics course draws in a wide range of students with different levels of preparation and experience in physics. Most are freshman and this is among their first college courses. Hafner believes that these factors, along with the sheer number of students, creates a climate in which students are intimidated, nervous, and afraid to ask questions. It uses a technology that all students have readily available with them in class. It is (effectively) anonymous, encouraging questions that students would likely not ask in front of their peers. It provides occasional breaks to the monotony of the lecture. It makes the course feel more personal and engaging for students. For those questions that go unanswered during lecture (due to time constraints), Hafner sends the student a text message after class with an answer to the question. The problem with this is that only the one student gets the benefit of hearing the question and its answer. In the coming year, he will post the questions and answers that were not addressed during lecture to the class webpage to enable all students to see them. Professor Hafner earned his Ph.D. from Rice University in 1998 under Richard Smalley for work on carbon nanotubes, and pursued postdoctoral studies at Harvard University with Charles Lieber. He returned to Rice in 2001 to join the faculty where his lab studies nanophotonics and interfacial biology. Hafner was named a Beckman Young Investigtor in 2002, and won the Norman Hackerman Award for Chemical Research from the Welch Foundation in 2011. He is currently a Professor of Physics and Astronomy and of Chemistry. Hafner is a Member of Scientia at Rice and has served as an Associate Editor for ACS Nano since 2010. He has taught freshman and sophomore physics for the past eight years, and is a member of Rice's Center for Teaching Excellence. He is on a quest to find a lecture demonstration that will get him fired. To find out more about Professor Hafner's popular EdX class for AP Physics look here. Posted on August 2, 2016 by Robin Paige and filed under Natural Sciences and tagged Audience Response Large Lecture Engaged Learning. Courses Description: This course is intended to provide students with hands-on experience surveying the biological diversity of a natural ecosystem. The course is focused on recognizing, quantifying, and analyzing biological diversity. Students work in groups to design, execute, and communicate the results of a systematic survey of particular taxonomic groups in the Big Thicket National Preserve in east Texas. The course includes a weekend-long field trip to carry out a bioblitz  in the Big Thicket National Preserve. explain why biodiversity is important and understand the main threats to biodiversity globally and locally. At the beginning of the course, the class visits Hong Kong Market in Houston’s Chinatown neighborhood, a large supermarket with a wide range of food products from around the world. Rather than providing students with a definition for biodiversity and telling them the various ways that researchers quantify it, they are challenged with the task of “sampling” the most diverse set of purchases they can within a one hour period and with a virtual budget of $20. The only rules are that any ingredient that is derived from a living thing counts as a species and that their total expenditure cannot exceed $20. The students then work in groups, exploring the supermarket and writing down (or taking photos of) the products they choose to sample. After one hour, the class meets up and they are asked to explain (1) how they conceptualized the meaning of “diversity” in the context of the assignment (e.g. a diverse sample could include the greatest number of different species, an even distribution of different species, or species that come from different taxonomic groups or geographical regions); (2) what strategy they used to maximize diversity (e.g. include inexpensive processed products that contain many ingredients, like spice packets; split up to cover as many sections of the supermarket as possible); (3) how might one determine how complete the survey was (e.g. by determining how many new species are added with the addition of each new sample); and (4) how the exercise is similar to sampling a natural ecosystem (e.g. inability to include all individuals in a sample, constraints of time and resources), and how it is different (e.g. how easy it is to “capture” and identify individuals, spatial arrangement of individuals). With this activity students learn that there are numerous ways that biological diversity can be quantified, that there are always constraints, both temporal and financial, necessitating decisions about the how to best allocate the available resources given the goals of the project, and that a biological survey is always incomplete, but that there are ways to estimate what was missed. The main focus of the course is the survey of the species diversity within the Big Thicket National Preserve, located in east Texas. Students are assigned to groups, each of which is given a particular group of organisms (e.g. trees, fish, butterflies and moths, reptiles and amphibians, birds and mammals). The groups are then tasked with designing a method for surveying that group of organisms in the Big Thicket National Preserve within a 24-hour period. Each group is matched with an expert consultant who they are encouraged to contact for advice; rather than telling them what methods work best, the consultants (as well as the course instructor and TA) provide feedback on suggestions made by the students based on research conducted by the students about sampling methods used by researchers working with that particular group of organisms. Each group submits a detailed written proposal and gives an oral presentation to the class explaining their proposed methodology as well as providing some basic information about the group of organisms they will survey (e.g. its taxonomic classification, identifying characteristics, and what species are common in the region). To help prepare for this assignment, the class visits the field site where the surveys will take place so that each group can provide specific information about exactly where their sampling will occur and may try out some of the techniques they hope to utilize. Following feedback from the instructor, TA, expert consultants, and their classmates, the students execute their surveys during a weekend-long field trip to the Big Thicket National Preserve. Survey methods include seining for fish in a stream, collecting butterflies with aerial nets, setting up motion-activated cameras to photograph reclusive mammals, and setting up pitfall traps for reptiles and amphibians. Some groups collect specimens that they curate using appropriate methods and later deposit into a museum collection. Expert consultants participate in the weekend bioblitz survey. Students share the results of their biological surveys by posting images and information about species they observe in the field using the website iNaturalist.org. This site is publicly available and contributes to a growing database of observations used by researchers and amateurs alike. Students submit a written report and deliver an oral presentation to the class that describe the results of their biological survey of a particular taxonomic group in the Big Thicket National Preserve. 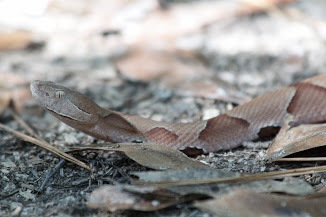 The reports are compiled into a single document that is shared with the National Park Service and contributes to the ongoing effort to catalogue and monitor the species that occur within the preserve. Sharing their results with their classmates, the National Park Service, and with the general public is meant to help students reflect on their results, to place them in the larger context of the biological diversity present at the sampling site and in the region, and to understand how such data contribute to the efforts of others, who might use their samples or observations for a wide range of different research projects. As each class of EBIO 327 students adds their results, they are gradually building a database that may be used by future researchers to monitor the status of endangered species or to document the spread of invasive species. Solomon says that the idea for the bioblitz assignment came gradually. He has taught this course for several semesters using a different approach, in which students carried out surveys of particular types of organisms in different habitats following a standard set of instructions provided by the instructor. Although this approach had its advantages (e.g. higher success rates, more consistency across groups and across years), Solomon felt it lacked both the authenticity of working on a real project in which the results would be utilized by community partners as well as the ownership that comes with developing a project on one’s own. When considering ways to reinvent the course, he found examples of “bioblitzes” conducted by other organizations, which are typically conducted as citizen science projects open to the general public. Modifying such an activity into a class project that still collects meaningful data seemed like a win-win proposition! Solomon says than one of the biggest struggles he has faced as an instructor is determining how much guidance to give the students as they design their surveys. Specifically, he struggles with determining how much information to give them from previous semesters. On the one hand, students would benefit from knowing exactly what has been done previously and how successful it was. On the other hand, he believes that students get a better educational experience (in terms of both learning gains and project ownership) when they design the survey themselves rather than simply repeating what has been previously done. Likewise, we are somewhat constrained in terms of what methods can be used based on what approval we have from the National Park Service and the IACUC (Institutional Animal Care and Use Committee). The compromise he has found is to allow students to suggest a sampling methodology based on their own independent research, and then have instructors and expert consultants point out additional considerations, potential problems, or suggest alternatives. They also have access to some of the results from previous semesters through iNaturalist.org, but not their detailed sampling methodology. Another challenge with this approach is that the student experience differs quite a bit depending on which group they are in. For example, the tree group has no trouble finding their focal organisms (they are in a forest, after all), and typically are able to identify all individuals by sight during the survey. Other groups, such as the butterfly and moth group, typically have to collect samples that they bring back to the lab and have to identify using a microscope at a later date. This means that the workload and schedule differ for each group. Solomon has learned that it is important to be clear about this at the beginning of the course so that there are no surprises when students later learn that some groups have completed their work while others still have a lot of work to do. Additionally, one idea suggested by a student was to require students to do more research about the organisms they are surveying. 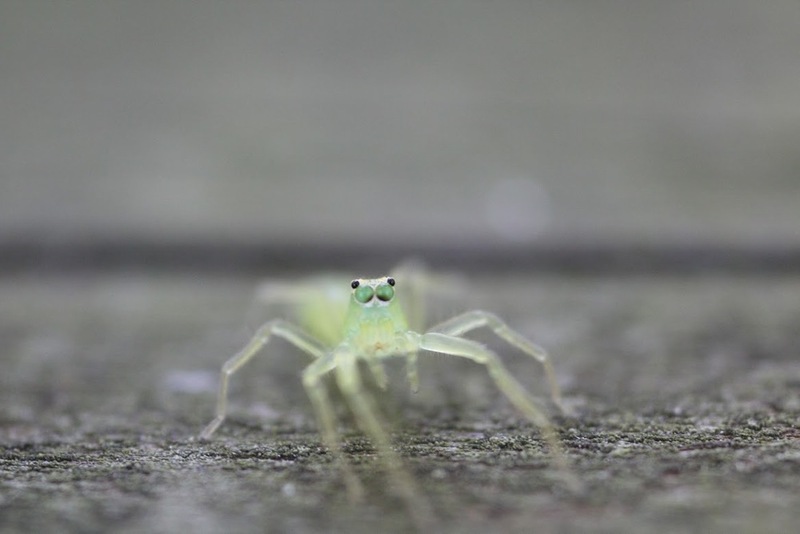 Currently, each group is asked to include some information about their focal organisms, but it might be helpful to include an additional assignment in which each group summarizes the natural history and behavior of their focal group before they begin working on a proposal for how to survey it. This would ensure that any important information (e.g. some members of the group are exclusively nocturnal or require a particular type of soil) are known when planning the survey. This document on experiential learning, put together for the faculty at Northern Illinois University, provides on overview of the theory and practice of experiential learning. University of Delaware's Institute for Transforming Undergraduate Education provides extensive resources on problem-based and project-based learning. The National Center for Case Study Teaching in Science at the University at Buffalo provides faculty in the sciences with teaching resources, a case study collection, and other resources for applying action-based learning techniques. Professor John Peter's Problem-Based Learning & Scientific Inquiry in Introductory Biology project in the department of Biology at the College of Charleston is an excellent resource of problem-based learning in the biological sciences. He provides a PBL instructor resource library on his webpage. The Vanderbilt Center for Teaching provides a list of Best Practices in Community Engaged Teaching for instructors in any discipline. Campus Compact is a comprehensive resource for faculty wishing to implement service learning and community engaged pedagogies in their classrooms, departments, and on campus. Geiger, Elke. 2010. “Service Learning Toolbox: Work Pages and Checklists to Help You Get Started and to Keep You Going.” Northwest Regional Educational Laboratory. Portland. Professor Solomon received a Ph.D. in Ecology, Evolution, and Behavior from the University of Texas at Austin where he examined the evolutionary basis of biological diversity in the Amazon Basin. Before joining the faculty at Rice, he worked as a postdoctoral researcher with the Smithsonian Institution in Washington, DC and the State University of São Paulo in Rio Claro, Brazil. He teaches courses in introductory biology, ecology and evolutionary biology, insect biology, tropical field biology, and scientific communication. Professor Solomon has been a Faculty Fellow at the Center for Teaching Excellence since 2014. In addition to his research on the biology of ants, he speaks and writes about science for the general public. His writing has appeared in publications such as Slate and Wired.com and his first book, Future Humans: Inside the Science of Our Continuing Evolution will be published by Yale University Press in 2016. Dr. Solomon is also a Resident Associate and Faculty Fellow at Baker College, where he lives with his wife, Catharina, and their three children. A Bioblitz is a 24 hour event in which teams of volunteer scientists, families, students, teachers, and other community members work together to find and identify as many species of plants, animals, microbes, fungi, and other organisms as possible. Posted on February 22, 2016 by Robin Paige and filed under Natural Sciences and tagged Experiential Learning Project-based Learning Service Learning. Course Description: This course covers the history of Jerusalem, exploring Jerusalem’s significance to the three major monotheistic religions and to the modern state of Israel. As part of the course students travel to Jerusalem over spring break where they encounter the sites they study in class. Students experience Jerusalem as a modern, living city. Through a study of the historical, cultural, religious, and political important of Jerusalem, coupled with students’ own observations and experiences from their visit to the city, the course aims to encourage students to develop analytical tools for understanding the place of Jerusalem in its contemporary contexts. Level A: Gain a basic knowledge about Jerusalem. Politics: become familiar with the basic political issues pertaining to Jerusalem. Level B: Become an informed reader of Jerusalem. The media: learn to identify bias in contemporary representations of Jerusalem in mass media as well as in scholarship, especially where bias is not obvious or hides behind the appearance of scholarly objectivity or scientific truth. Level C: Become an informed visitor of Jerusalem. Henze and Weininger designed the course with a pedagogical approach that seeks to provide multiple perspectives on the city of Jerusalem with an emphasis on the integration of the old and the new and the interconnection of history and modern life. The course is designed to provide students with the critical tools necessary to develop their own analysis of Jerusalem today. In order to achieve this, Henze and Weininger built the course around an experiential learning opportunity during the middle of the semester. The course is divided into a three-unit class with a one-unit week long ‘urban immersion’ in Jerusalem over spring break. To prepare students for an intensive week of travel within Jerusalem, the first half of the course focuses on building a foundational knowledge of Jerusalem that prepares students for a mindful and critical engagement with historical-political context of contemporary Jerusalem. One of the primary ways that students prepare to become informed travelers to the city is through the collective production of a travel guide that each student bring with them on the Jerusalem trip. Each student produces one chapter of the travel guide highlighting a historical site the students are likely visit on their trip. In addition, prior to leaving for Jerusalem each student gives 20-minute presentation on their chapter of the travel guide. According to the Henze, students’ coursework prior to the trip gives them “the confidence, when in Jerusalem, to ask questions and add to the conversation”. But Henze and Weininger say the real learning happened over the course the seven-days that they lead the students through key historical and contemporary sites in the city of Jerusalem. Each day’s itinerary includes tours, visits, and speakers that provide students with the opportunity to explore the city, its rich history, and the contemporary context. Henze and Weininger also carefully planned visits and opportunities for students to encounter a variety of people with different backgrounds, religions, and perspectives. For example, students spent one evening in conversation two family members from the Bereaved Families Forum – one Israeli and one Palestinian family– who have lost loved ones to violence in the city. In addition, there are daily opportunities for students to collectively reflect on their experiences in the city. Henze and Weiniger say that regular opportunities for critical reflection with the professors and other students are essential for students to process their own emotional and analytical responses to what they are seeing, hearing, and experiencing during their time in the city. It is this reflection, they say, that enables students to construct their own knowledge, ideas, and values about the city of Jerusalem. Once back in the U.S., students return to the classroom with Henze and Weininger where the second half of the course provides students with the opportunity to use the knowledge and experience they gained from the trip to analyze major political, cultural, and social issues in the classroom. Guest speakers from across campus and the Houston community, such an archaeologist working in Jerusalem and a former Ambassador to Israel from the Baker Institute, are brought into the classroom where students can ask questions informed by both their experiences in and studies of Jerusalem. Henze and Weininger’s vision for the course was to create an atmosphere of respect for diverse ideas, opinions, and personal relationships to the course material. They began by selecting students with a variety of academic interests, religious backgrounds, and approaches to the material. In order to attract the best pool of applicants Henze and Weininger wanted to insure that the cost of travel to Jerusalem would not be a barrier to participation. Therefore, the students’ travel and lodging costs were paid for in part by supporters of the Program in Jewish Studies. In the end, fifteen students were selected to take part in the first offering of the course. From the beginning Henze and Weininger focused on creating a community of trust, respect, and engagement among the students that facilitated peer-to-peer learning. All aspects of the course from assignments to the organization of student time while in Jerusalem were designed to help students develop the pedagogical skills to be each others instructors and to put those skills into practice. For example, Henze and Weininger asked students to keep an electronic journal by blogging about their learning, reflections, and experiences over the course of the semester. These blogs became a way for students to process their own learning, as well as, to learn from each other as students read and commented on each others blog posts. 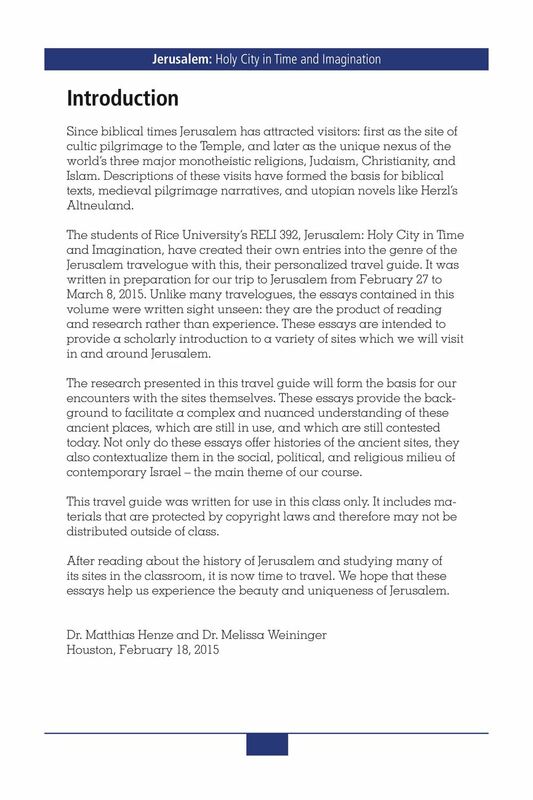 According to Henze and Weininger this assignment proved essential to creating a strong and coherent community of students once they traveled to Jerusalem as the interaction on the student blogs enabled the class community to extend beyond the more structured face-to-face interaction in the classroom. Henze and Weininger plan to teach the course again in the spring of 2017 with some minor changes to the course design. The class presents some logistical challenges. Traveling abroad to a region of the world that is frequently subject to travel advisories means that flexibility has to be built into the course design as well as the travel plans. While both the travel to and within Jerusalem worked out well this time around, for the next iteration of the course they will make minor changes to the itinerary for flexibility and to avoid repetition. The most valuable experiences for students were the personal encounters they had with people in both formal and informal settings. For the next trip, they plan to increase the number of personal encounters on the trip. Students were attracted to this course for a variety of reasons but most of them held deep emotion connections – whether they were religious, intellectual, or personal - to the city. These emotions were brought to the surface and often intensified once in Jerusalem. For future iterations of the course, Henze and Weininger, want to focus on ways to not only provide for the emotional well-being of their students, but to enhance the support the students can offer each other. The course provided students with the tools to reflect on their experiences, beliefs, and viewpoints, but for future iterations of the course they want to provide more opportunities for students to develop their critical research skills. In order to help students integrate their experiences in Jerusalem with research projects, they plan to (1) provide a framework beginning early in the semester for students to begin thinking about their final projects and (2) devote classroom time to teaching students how to approach a research project and reading scholarly texts and guide students through the process of research step by step. This webpage provides a wealth of information about the philosophy, practice, and theory of experiential learning. This guide on Team/Collaborative Teaching from the Vanderbilt Center for Teaching provides an overview of team/collaborative teaching and presents three models. The article “Team Teaching Benefits and Challenges” from the Center for Teaching and Learning at Stanford University’s newsletter Speaking of Teaching provides practical tips for team teaching. The blog post “Teaching the Storm: Pedagogical Lessons from Alice Goffman’s ‘On the Run’” from Rice University’s Center for Teaching Excellence addresses how to teach controversial topics and research. The guide “Using Discussion Questions Effectively” provides tips on how to ask questions to generate conversation in the classroom. The article “Managing Hot Moments in the Classroom” by Lee Warren from the Derek Bok Center for Teaching and Learning at Harvard University discusses how to find the teachable moments in every discussion. The blog post “Building Social Connections Through Discussion for Better Learning” from Rice University’s Center for Teaching Excellence focuses on how to build community in the classroom. Dr. Henze's academic interests are broad, though the focus of his published work has been on the Jewish literature from around the turn of the Common Era, with an emphasis on early Jewish apocalyptic literature. His most recent monograph, Jewish Apocalypticism in Late First Century Israel, is the first of two interrelated volumes he is writing on the Syriac Apocalypse of Barcuh, an early Jewish apocalypse. Dr. Weininger specializes in the study of modern Hebrew and Yiddish literature, with an emphasis on gender, nationalism, and ideology. Her research includes work on Jesus in modern Jewish literature, gender and modernity, and nationalism in contemporary Israeli literature. Her most recent publication is an article on A.A. Kabak's Hebrew novel about Jesus, The Narrow Path, and his development of an ethics of nationalism. She is also working on a project on the role of gender and nation in modern Jewish literature and culture. Posted on October 8, 2015 by Center for Teaching Excellence and filed under Humanities and tagged Seminar Experiential Learning Team Teaching Peer Learning.